For details of current events and training opportunities please see our training and events page. The formal launch of HighLight was followed by a tour of the newly refurbished King’s school by the Principal – Mr John Ellwood. A day conference for those called to inspire young people. A residential 5-day course set in the Malvern Hills for those exploring how to develop a Christian ethos and approach in education. – Really very helpful. Inspiring vision with practical tips. Suited to Christian schools and Christians in schools, but also for anyone responsible for any kind of education: parents, managers, pastors, preachers. – Great! I will definitely use this [Discipline Cycle] in dealing with my students, other people’s students and staff on my team. – Thank you for today. I found it really interesting. A lot to reflect on and some useful tips to put into practice. I particularly found the session on Wisdom in Behaviour Management useful. – I found the day encouraging and thought-provoking. I found the Cycle of Discipline very helpful as a model. The ideas around the curriculum are not directly relevant to me, but give me food for thought which I think I can apply in other situations. It was nice to hear examples about individual pupils and situations. There has been a lot to take away from the day. Tabernacle School, London hosted a day conference on the hottest day of the year! 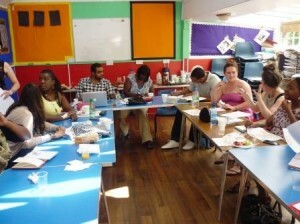 Delegates were heads, teachers and youth workers from the area. HighLight director, David Freeman, addressed the challenge of our aims for young children including the interpretation of the Early Years legal requirement so that the right foundations are laid; including the spiritual dimension of children. Early Years leader, Joy Cartwright, from Emmanuel school, Derby, led the delegates through planning curriculum which will reflect the ethos of the school. All expressed that they were stimulated and equipped by the day. Launching HighLight’s new materials, this day conference helped teachers and those in school leadership explore what it means to unlock wisdom in education – in competence, character and curriculum. Topics included ‘Developing Distinctive Curriculum’ and ‘Effective teaching and learning methods in the Classroom’. 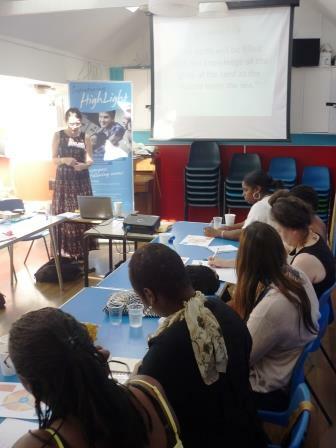 Topics included a curriculum workshop on ‘Wisdom in Curriculum’ and sharing HighLight’s vision for education.